This forex system detects short term forex intraday waves, it contains sophisticated forex indicators that all together detects good entries for new forex waves formations with the best accuracy. 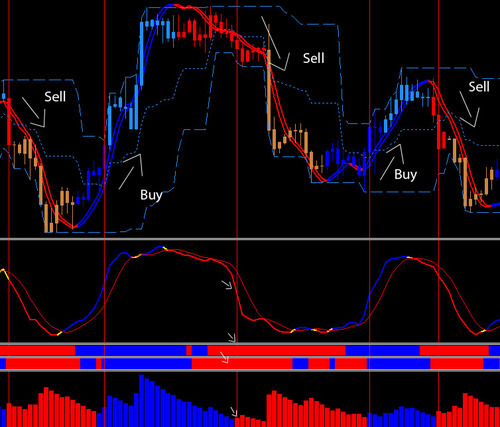 With this forex system you make pips in choppy and trending forex markets. It has a very good risk/reward ratio, your stops will be tight, because you will enter a trading position with the right strengh of the currency, so you only need to put short stops to maximize forex earnings. This way your losses will be small and your forex earnings will get bigger, even if you have more losing forex trades than winners you will still profit, because the winners will be much bigger than your actual losses. Having said that, a winning trade will cover many losing trades and that's how the profissional forex traders do their job, always working with very good risk/reward ratio. Manual included. Forex Disclaimer: Trading foreign currencies is a challenging and potentially profitable opportunity for educated and experienced forex investors. However, before deciding to participate in the Forex market, you should carefully consider your investment objectives, level of experience and risk appetite. Most importantly, do not invest money you cannot afford to lose. There is considerable exposure to risk in any foreign exchange transaction. Any transaction involving currencies involves risks including, but not limited to, the potential for changing political and/or economic conditions that may substantially affect the price or liquidity of a currency. Moreover, the leveraged nature of forex trading means that any forex market movement will have an equally proportional effect on your deposited funds. This may work against you as well as for you. The possibility exists that you could sustain a total loss of initial margin funds and be required to deposit additional funds to maintain your position. Forex Investors may lower their exposure to risk by employing risk-reducing strategies such as 'stop-loss' or 'limit' orders. Forex, futures and options trading has large potential rewards, but also large potential risk. The past performance of any trading system or methodology is not necessarily indicative of future results. You must be aware of the risks and be willing to accept them in order to invest in the Forex, futures and options markets. This trading system requires trader's discretion. Don't trade with money you can't afford to lose.